2020 Pre-Application Deadline is September 28, 2019. Please note that pre-applications can be submitted after the deadline for project needs that may arise with proper justification and at the discretion of the Governor’s ARC Alternate to accept. Pre-application forms and instructions are available below. What: The ARC is a federal-state economic development program designed to assist in the economic development of Appalachia through a diversity of projects in the areas of public infrastructure (water, sewer, solid waste, housing, and telecommunications), human resource development (education/workforce development, affordable/accessible healthcare, and leadership development) and business/entrepreneurial development. 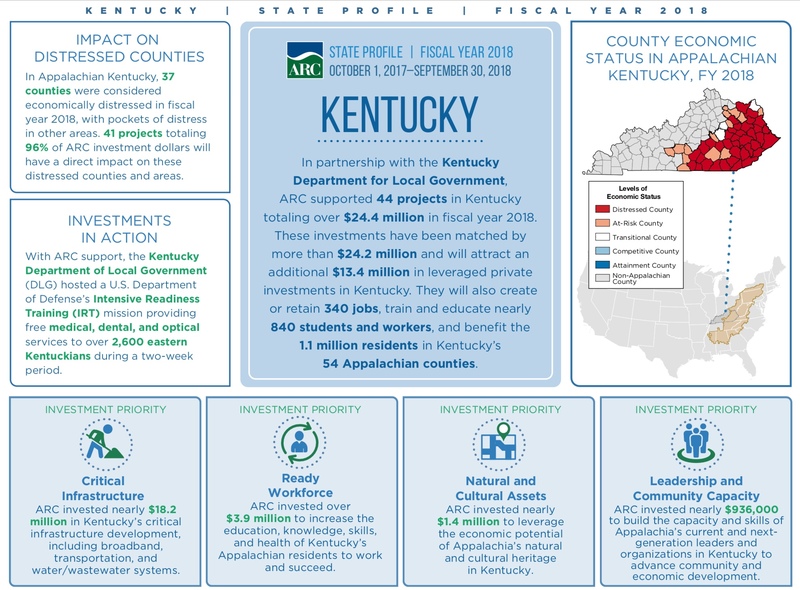 Why: Historically, the far eastern region of Kentucky has lagged behind the rest of the nation in terms of economic development. The ARC grant program provides the region with financial assistance in creating jobs, developing a workforce, and providing health care and education services. Who Can Apply? Local governments, special districts, and non-profit entities that include Kentucky's 54 most eastern and southcentral Counties are eligible to apply for the grant dollars. Thirty seven "distressed" counties also have access to a separate restricted allocation of funds. Projects that are $400,000 or less are more competitive, the average grant size is $275,000. Matching requirements are fifty percent (50%) for transitional counties, thirty percent (30%) for at-risk counties, and twenty percent (20%) for distressed counties. Federal Funds may not exceed 80 percent of the total project. Examples of eligible projects are: water/sewer line extension and treatment expansion; telecommunication/broadband deployment; learning center development; education/workforce development training; industrial site development; asset-based development planning/activities; and, leadership development/civic capacity building. Application Process: Pre-applications for Fiscal Year 2020 are being accepted through September 28, 2019.